Mom's Blog - don't call my mom the "B" word! Blog With The BIG DOGS! Mom made all the graphics on this site. The logo with the dog leash and tag is not a photo...it is a graphic she created by hand and mouse. (mmmm....mouse...) If you like her work, please go visit her other sites and buy her dingbat fonts and graphic CDs or hire her to create graphics for you so that she can get me treats. Copyright © 2000, 2001 Ann Stretton. All Rights Reserved. No part of this website may be copied or reproduced. 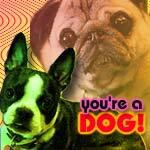 You're a Dog! You're self-confident and love food. You have punky short hair and a matching snarl with crooked teeth and pug nose. Your attitude will take you far, but you better stay away from long flights of stairs and chocolate! What un-famous, un-celebrity from Ann's Little Microcosm of Animal Life are you? Take the quiz! My family is weird. Tonight, Caligula got caught inside the stove on the side of the broiler while Dad was cleaning it. It was weird. Dad pulled him out. Caligula is so fat so he was kinda stuck. It's a good thing the stove wasn't on. Then Mom was playing with these little balls that are metal and make noise when you shake them. They're from China. So is Hieronymus. Well, not really, I mean he was born in Sauk City or something, but his breed is from China (mine's from Boston which is why I'm better than most dogs). So mom's playing with these balls and they're making this really nice noise, not loud or tinny, but mellow and musical, and Hieronymus who usually can't hear his own name when you're yelling at his face, starts jumping up at the balls like he wants to play with them. I never saw him like that before. Yesterday, Mom and Dad took Caligula and me for vet appointments. I don't like the vet. It's usually a different lady each time, but I don't like any of them because they poke things in me. I am so jealous...Caligula went before me. The vet called him the "model cat" because he just sits there like a lump while they poke at him and stuff. I think he had enough, because he started snuggling with me on the vet's table while they were poking him. The vet thought it was soooo cute...oh look at the cat snuggle with his dog buddy. Never once did they say I was the "model dog" because I let a cat snuggle with me. Then they told me, "See Plato, it really doesn't hurt that much, see, Caligula didn't make a fuss." Oh please. That's just because Caligula is a big bag of fat...me, I haven't an ounce of fat on me, I'm a lean, mean, barking machine. Of course it'll hurt me more when I get poked in muscle instead of fat. What, do they think I was born yesterday? Grapefruit is SCARY! Keep it away from me! Feeling a little weird today, still. Guess you better read what happened to me on New Year's Eve in mom's journal....she probably tells it better than I can right now. I threw up a lot, but darn, that chocolate sure was good. I'd eat more any day...just don't understand how something so good can be so bad, but that's what mom says. I was really mad that she kept putting that awful tasting stuff down my throat to make me sick. I think I'll go back to sleep now. Mom and dad keep blankets on the couch in the cold weather so they can keep warm. So I get to snuggle on the couch all day long. Natasha, who was very sick as of my last blawg post, died on Labor Day. It was sad. But now Persephone is the queen cat and she's acting very loving to me. Sometimes she'll rub her head against mine, or come lie down on me when I'm on the couch. But then again, she does that to Caligula too, so I don't know if I'm that special to her. Hieronymus and I got boarded at the end of September so mom and dad could take a trip. There were lots of new dogs to bark at. In October, we took a visit to Colorado. I hadn't been there since I was a little puppy, so I forgot about it. We stayed with mom's parents (grandpa hates me) and I got to sit on grandma's lap, but she said I was too heavy. I stayed with them a lot while mom and dad went to see friends of theirs. I liked their yard...it was big and Hieronymus and I had lots of fun. Then we went to see dad's mom and her twin sister. I was confused at first...when I went to their house, I saw two ladies who looked the same. I was VERY confused. They both loved me. There were lots of things to see and the mountains were big. Well, that's about it, after Natasha got sick and we went on trips, I just forgot where I placed my blawg. But I was rooting around the other day, as all terriers do, and, well, here it is! Oh, yeah, it was Hieronymus's birthday yesterday. He's 11. Wow, that's almost 70 in small dog years. He can't hear as well as he used to. Mom and dad have to shout at him. Oh, and Mom got a new blawg. Hey! Stinky is featured at Crazy for Dogs this week only. They said I'll be next. Age before beauty, I guess. A few weeks ago I went behind and underneath mom's and dad's bed because it was fun and Natasha would hide there and it smelled like her. They got mad at me and told me to get out of there, and then they said, "Just for that, Plato, we're going to move the bed so you can't do that anymore." I didn't believe them, but yesterday they moved the bed to the room downstairs. It got higher too, and I couldn't jump up on it, or at least mom wouldn't let me. I can't believe they followed up on their threat. Look what I am for June 13! Elvis would be proud...this ain't nothin' but a HOUND BLOG. Did I tell you I learned to bark like a hound once when Mom and Dad left me at a kennel to take a trip?